This board is the only one in the computer that has large-scale integrated circuits (LSI). The LSI's are the EPROMs, RAM, and a UART for serial communication. 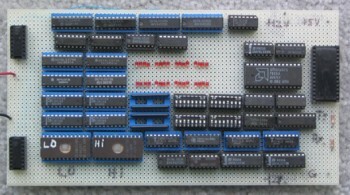 Other chips are 74LS series buffers and address decoders. The rows of switches and the nearby rows of LED's are simple 16-bit input and output ports, respectively. These are very useful for debugging of hardware and software. There is also a 16-bit port configured as a byte-switcher. That is, when a 16-bit word is written to the port, then read from the port, it comes out with its low- and high-order bytes switched. This port allows one to download the high-order bytes from the 16-bit memory to the 8-bit serial port. The computer cannot accomplish this by arithmetic because the path through the ALU is only 12-bits wide.